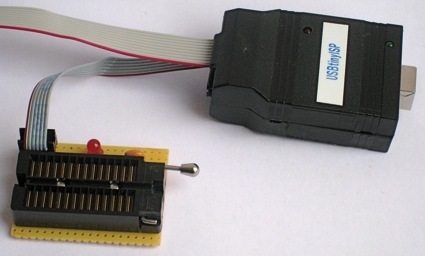 Several times now, I had to use an Arduino board to program an ATmega chip via the ICSP socket (to change fuse bytes or to set up / change the bootloader). Which works fine, but at some point the IC socket is probably going to wear out. The LED and 16 MHz resonator are not strictly needed, but this way the board also lets me run a test program at full speed and report its status via the LED.